Click to see it bigger. My favorite summer treats aren’t the usual ideas of summery fun. 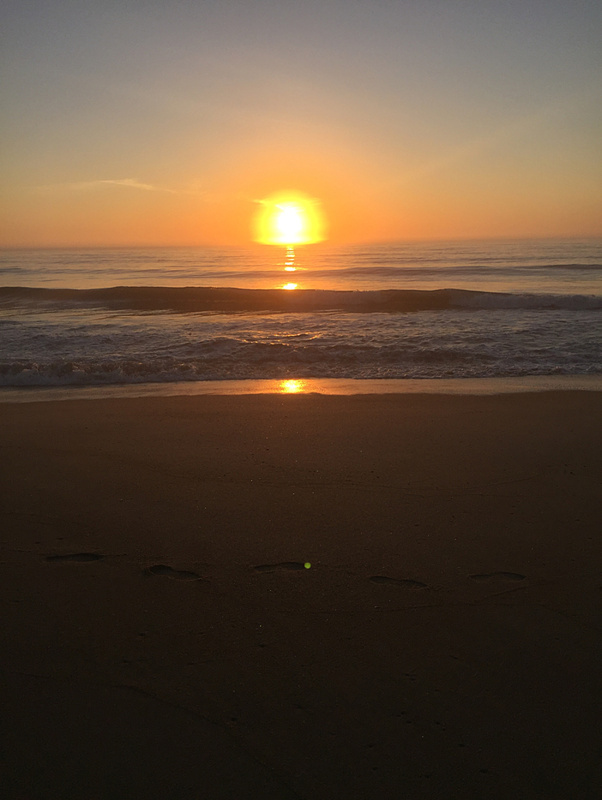 I did get to the beach this summer, and I’m adding a pic on the right of our last day there, where we caught the sunrise. You can’t see them in the picture (because I chose to enjoy the moment, rather than try to capture it and miss it), but dolphins were playing everywhere that morning. Back to my unusual summer treats; my favorite thing about summer is that my kids are home. (Mostly, if they’d stop visiting all the grandparents.) I know that part’s not so unusual. Lots of people enjoy that. The thing is, we’re sort of mole people. We stay inside with one of my other favorite summer treats–central air conditioning. Obviously, I’m old enough to have not had it so, believe me, I know the difference. There’s a lot to be said for low humidity and a constant temperature. And that brings me to my final summer treat: constant video games. Now that there’s no studying we can do anything we want. There’s reading, some TV (not as much as you’d think), and lots of video games. We play Legend of Zelda. We have several different versions of the game going now concurrently. I play Animal Crossing: New Leaf on my 2DS and the kids play different games on theirs. Fire Emblem, several incarnations, is a big one this summer for the oldest. So, now that I’ve admitted we’re mole people who can’t leave the cool, dark rooms, what’s your guilty pleasure of summer? I’d love to hear from you or you can click on the links below to go on the Blog Hop! Many of the blogs here are offering there own contests. Sign up for my newsletter and be entered to win a $10 Amazon GC. Before you click through, register for your chance to win a Kindle Fire from The Wild Rose Press! That sounds divine, Anni. I’m right there with you. Lori, lots of my friends are like you and stay indoors. Thanks for sharing. Thanks, Kayden. My theory is that many of us aren’t acclimated to the extreme summer heat anymore thanks to the aforementioned central air. I do like to ride on the motorcycle with my husband. For that, I’ll put up with the heat. Beautiful picture of the sunset over the sea. I don’t blame you for watching the dolphins rather than trying to photograph them. I have to admit I am an outdoor person myself, though. I love being out and about in the countryside – but the weather in the UK is a lot cooler than it must be with you. This last week was really warm for us, with temperatures reaching 90 although we’re usually lucky if they get to 70! Not many private houses here have air conditioning either – it’s just not necessary and if it does get warm we just open the doors and windows! Your summer pleasures sound fine! I wish I could spend time with my kids again but they have children of their own. Great photo! That sounds like my dream weather, Hywela. I’ve always said, if I could live somewhere in the 70s, I’d be so content being outside. It was 100 here today. I stayed inside, playing video games with my kids. No regrets! My oldest doesn’t live at home anymore and she’s on her way to making me a nana for the first time. I miss those days with her so. much. But I’m very excited for the future. Thanks so much, Kimberly. I think for me, the guilty part just means not having mainstream acceptance. I’m happy to be a bit different. Lana Del Ray music, huh? I will have to take a closer listen. This post makes me miss the days when my kids were little. We did read-alouds until they were teens, as long as I didn’t mind them playing while I read. As long as they’re in the room with you, I don’t think there’s anything to feel guilty about! I’m more an autumn, winter gal, so summer is one that I’ll tolerate. I’ve learned to embrace it more as I’ve gotten older, but it’s my least favorite season. I’m more a “Highland lass” than a “Tropical gal”. I don’t have any guilty pleasures, but I do like to visit a local winery, where they have concerts in the evening. Thanks so much for sharing, and I love your sunset photo! I definitely agree with you. I much prefer that chilly bite of autumn. Your concerts sound wonderful! The comraderie of being together, even if we’re doing different things is one thing I’ll never get enough of. Thanks for commenting, Nell! Love your activities. They mirror mine for the summer. Hi Lori what a fun post! I find that guilty pleasures are the best pleasures of all but they are ever changing although ice cream or gelato has never left my list. I completely agree–they are the best kind. I’ve never actually had gelato. I should put that on my to try list soon. Having a glass of wine on the deck is my guilty summer pleasure. That and hiding out inside with air conditioning. I’ve got to admit, I love it, too! I hope you’re enjoying your summer, Linda! Seriously, that’s one thing I’m so thankful for, AC. What did we ever do without it!!! I remember not having it and I did a lot of reading in the shade. I had a favorite spot in a family cemetery with a great view and lots of old trees. Whatever it takes to stay cool, Lori! I’m with you! Thanks, Jeanie. Staying cool and entertained are top priorities.